Shout! 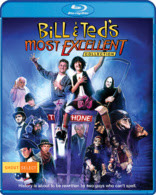 Factory has announced the special features for Bill and Ted's Most Excellent Collection. This collection consists of the two films and a bonus disc will probably house the majority of the features. Shout has not sent a breakdown of where the features will be housed (the commentaries are obvious). This features list looks really good. I am really excited about this. It seems that Shout! wants all of my money with this, The Thing, Carrie, Transformers: The Movie, Raising Cain, Metalstorm, The Adventures of Buckaroo Banzai, and the limited Double Features I talked about last week. Trailers for both films are after the features.